Ellie’s Brown Ale is brown and bright in the glass, topped by a tan head that lingers. Rich aromas, flavors, and mouthfeel-sweet chocolate and caramel malt throughout-which is offset early on by a roasty and toasty character and later by earthy hops. Who cares what the beer tastes like… I love the label. I don’t like dogs (except for Sophie) but I love this label for some reason. It’s cool that this is named after an actual dog. It’s Avery’s dog, from Avery Brewing Company. Anyway, let’s get to the beer. In the Glass: It’s rather thick in the glass, and doesn’t have much head to speak of. It does have a good Belgian lace though. (See what I did there?) It’s dark, almost black in the glass, and looks like a flat soda pop after the subtle head settles. Nose: At first it smells like any other brown should. But then you are hit with the cold caramel aroma that is hard to pull away from. The “cold” part is hard for me to explain, but when you stick your nose in the glass (not actually IN the glass) you will see what I mean. It leaves the nose with a hint of pine needles/nutty aromas. Flavor: There is a ton of flavor all around the palate when you first take a drink. It then settles around the outside of your tongue and slides down the throat with a weak but subtle aftertaste. It’s not very carbonated, and is a lot easier to drink than say, a Newcastle. It’s only 5.5% ABV, but these could sneak up on you in a hurry. Mouthfeel: It feels almost flat on the tongue. We drank this right out of the fridge, and I feel that a beer like this would get better as it reaches room temperature. But the mouthfeel is weak and leaves little to be desired. It’s the flavors I am after. Aftertaste: There isn’t much of an aftertaste, but what is there is solid. It has the same nutty nuance that you got on the nose, and the burp also reminds me of pine needles. Not sure where the whole pine needles thing comes from, but this is a good winter beer. I dig it. I like the logo, and while I am not a huge fan of a brown I would totally order this one again. Especially when it’s cold outside! We are doing another beer tonight! Well, Ricky says we are doing two, but I’m not sure if I want to do another one or not. I guess we will see. This one is a brown. 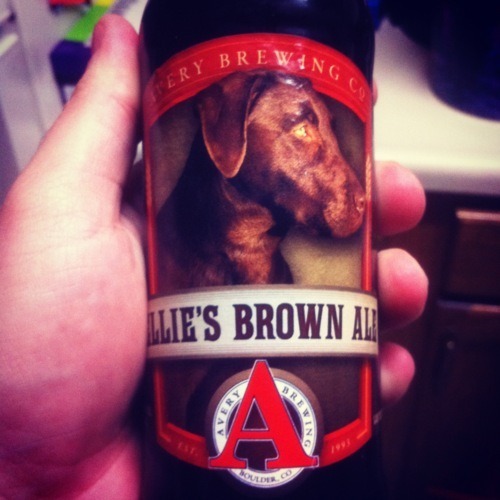 And… it had a brown dog on the label. Not sure what that means, but let’s try it out! It looks very dark and thick in the glass. Dark, but not black, just a very dark brown. It didn’t have a lot of head when I poured it into the glass. It smells very rich, with a kind of nutty smell to it. I kind of like browns, so I’m ready to find out how it tastes. Well, honestly, it tastes about as nutty as it smells. It’s a very good taste, though. I’d call it a “solid” brown. It has a full taste, but nothing too special about it. In this case, though, I’m okay with that. It really just has a very full brown taste. It’s the kind of beer I’d order in a restaurant. (I used to order the Brickway Brown from Rock Bottom Brewery before they were bought by Gordon Biersch. It was one of my favorite beers there.) This would be a good beer to drink during dinner. The flavors would pick up nutty tastes well, I think, and it’d also be good with something fried, like fish and chips. This is definitely one I’d order again.